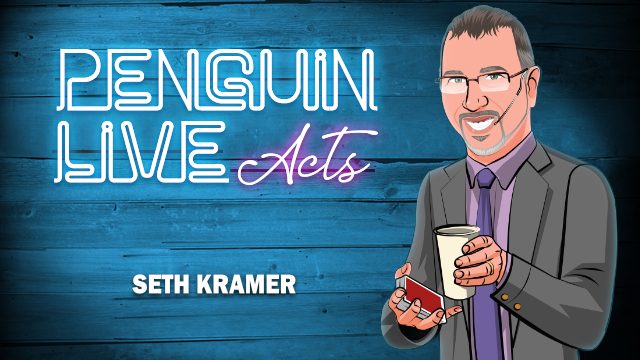 Today, when you order "Seth Kramer LIVE ACT", you'll instantly be emailed a Penguin Magic gift certificate. You can spend it on anything you like at Penguin, just like cash. Just complete your order as normal, and within seconds you'll get an email with your gift certificate. Purchase this product and on March 31st anytime after 12:00pm Eastern, click the MyPenguinMagic area at the top of the Penguin site. You'll see the "learn" button appear next to this lecture. I hadn't heard of Seth before this, but just watching him work proves he knows how to get a crowd. Seth runs this 15-minute act as though he's working a trade show, then goes into incredibly detailed information not only on the secrets of the tricks he performs but the minutiae of doing trade show work. And he shares it all, including which products to buy and where to find them. He includes a list of must-use words that can turn your presentation (and writing) into something captivating. This isn't going to be something for everyone necessarily, but if you have any desire to get involved in trade show work you'll grab a few nuggets from this one. Seth Kramer did a wonderful job with this lecture! I'm planning on going after trade shows in the near future here, and watching his lecture really tells just about everything you need to consider. He provides great tips on working the trade show arena. Things you would only know with experience. It was super helpful to see the trade show act in action and to see how and how much he incorporates a company message into his act. The real value though is in the info he tips that isn't the "teach a trick" portion. It's a wonderful companion to his Modern Trade Show Manual (which Dan references during the talk), or maybe the book is a great companion to this. There's even more added value to this lecture in that there's a private forum for those who bought this product where they can ask questions for Seth and have discussions with each other. I'd say this is worth way more than the price they're selling this lecture at (though I'm glad I was able to get it at such a great price)! If you want to do trade shows, get this! This focuses a lot on the trade show business, just like they explain in the promo. Seth has some strong card magic and I really enjoy the fast pace which he performs and somehow still doesn't feel rushed. There was one thing that Penguin has done a few times now which really annoys me. In the performance they do one effect and get to the explanation and say that they do not have the permission to share the effect and give an alternative or leave it out all together (this one was an alternative). Just use the alternative in the show or leave it out of the show! These shows are specifically for Penguin, they know explanations are coming up. But either way, Seth was great. Signed card to pocket and signed card to box were great. Some slightly difficult palming which my Trump sized hands will not be able to do, but I quickly found an alternative. I'm a Seth fan. I reviewed the video when it was first recorded, and now that it is out, I want to emphasize what an important lecture this is. The tricks are great and shows Seth's chops, but more important, if you're doing any corporate work - especially trade shows - then this is a MUST BUY! Seth has been working trade shows since the 1980's. He's worked with some of the same clients for years. There's a reason. He's that good! So, learn the secrets of a few tricks, but the BIG secrets of the corporate magic biz. Thank you, Seth, for sharing your knowledge. Forget the tricks, although they were also very good, what's in here is gold. His bits of knowledge and advice about equipment, promo material, websites to do promo stuff, etc, were worth more than any trick he could have taught. I took many notes and will watch again to take more. Wow!! Gold. Strong, strong advice if you want to do trade shows. This is the most complete lecture about magic, I have ever seen! Here you get all, not only practical tricks, you get an Act that works! You get information toabout to find work, to hold the work and about the money. Also you get great information about how to travel and good equipment. Even if this is a lecture about trade shows, it will work also great to have a pitch about the guest who has hired you, the restaurant or any other event! So think a little bit about it, when you practise the act and can make a good live in magic! Thanks for this deep inside Seth Kramer and the team from penguinmagic! Just spent time with Seth Kramer's Live Act. 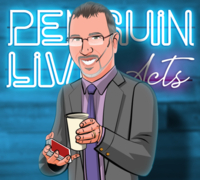 For those of you interested in Trade Show Magic, Seth shares a ton of information. 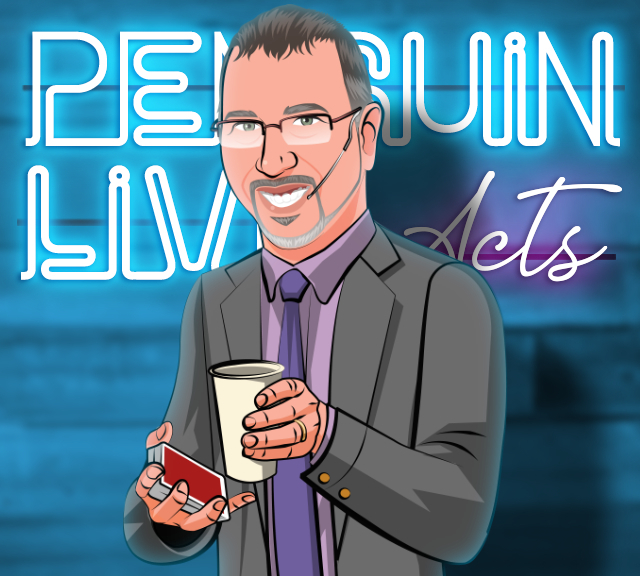 The act itself shows some great commercial Magic and Seth's great crowd gathering and control skills! Get this video and his book--You will have some great information to start off your Trade Show career!! Whereas the main value in this lecture may be the business and marketing advice, I've got to say that Kramer is an incredibly skilled, tight performer. The amount of razzle dazzle he gets out of an ordinary pack of cards and a string is really amazing. I wasn't familiar with some of the effects he did, but in Kramer's hands they're visual, fast moving and hard hitting. It's a treat - and somewhat exhausting - to watch him work. His act is a well oiled exhibition of technical skill, tight scripting and excellent audience interaction. There are some really nice effects in his act that you don't see a lot of other guys doing, and he offers pro tips and subtleties that he's picked up over the years for each. Although the explanations are brief, he sources the material so there's plenty to investigate after the lecture is over. --how to work the booth in order to communicate the marketing message(s) of the company you represent --so that the company shines. Seth also shares his methods and tips for stopping the traffic, as well as how to ultimately hand over qualified leads to your sales staff at the end of each show (this alone is gold). Seth even covers the type of promotional give-aways that can generate significant added income, beyond your regular fee. In addition to sharing all of this valuable information on the business and performance aspects of becoming a successful trade show magician, I really appreciated Seth's down-to-earth style of communicating and his willingness to share his lifetime of experience (gained through more than 600 shows), in an effort to genuinely help those that desire it, build their career as a successful Trade Show Magician.